Some 120 people showed up to celebrate the opening of the Lifelong Learning Center, on the corner of Hampstead and Glenwood. Lifelong Learning is a program that opened at 11a.m. on Sept. 12, to provide education to the 50 and older community, and create diversity on campus. Shipp continued to highlight the importance of the Lifelong Learning program by saying that people never really stop learning. Kathy Zuckweiler, director of adult and professional education, talks to the guests at the opening of the Lifelong Learning Center at 2527 Hamstead on Sept. 12. 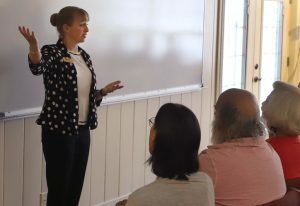 Kathryn Zuckweiler, director of adult and professional education, said the desire is to create a place and opportunity for people over the age of 50 to engage and learn. Zuckweiler said most classes will be housed at the Lifelong Learning Center. “The most important part is outreach to the community,” Zuckweiler said. 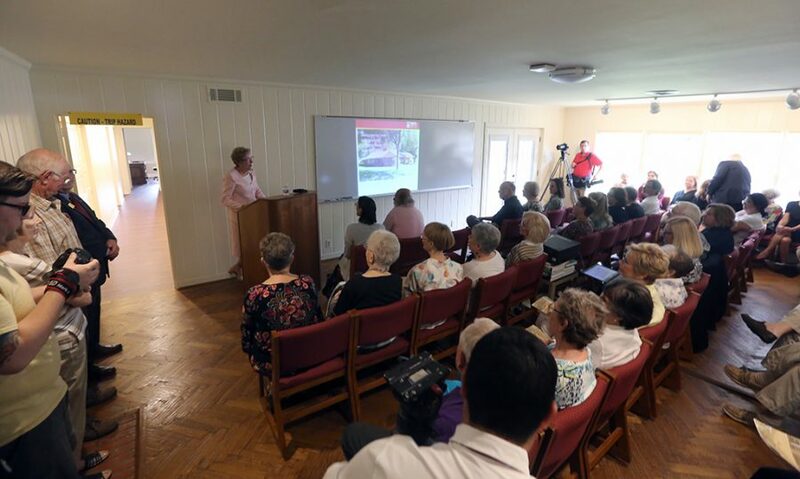 Julie Gaynor, director of marketing and public information, agreed that the Lifelong Learning Center will create an avenue to reach out to an older population not previously served by the university. “It’s a wonderful way to serve the community in a way we haven’t been able to before.” Gaynor said. University President Suzanne Shipley quoted in her introduction Virginia Woolf’s essay, “A Room of One’s Own,” to stress the importance of providing a location for people of the community to gather together and learn. Within her speech, Shipley created a parallel between the women in “A Room of One’s Own” and the older population, who have both, for many years within their respective life-times, been deprived of the same opportunities to attain higher learning that was readily available to their societal counter-parts. Shipley said universities and other public spaces, provide a bridge between private and public learning. She also said it is important that today’s universities readily provide a room of their own.